Have you ever wondered how to decide what kind of visual schedule to use for your students? There are so many types of visual schedules from object schedules, picture schedules, photo schedules to written schedules. Knowing which type is best for which students can be a difficult process. We don’t have a ton of guidelines about how to make decisions other than trial and error. However, I thought I would share my process to give some tips of where to start. I generally start with picture-symbols. It used to be Boardmaker, but now I use mine that are made from clip art. Other software like Smarty Symbols or Symbol Stix would work as well. Regardless of the specific type of way it is produced, pictures are definitely the most common way to make schedules. And many of our students are able to use them effectively. I don’t know the student’s skills at recognizing and comprehending text or pictures. 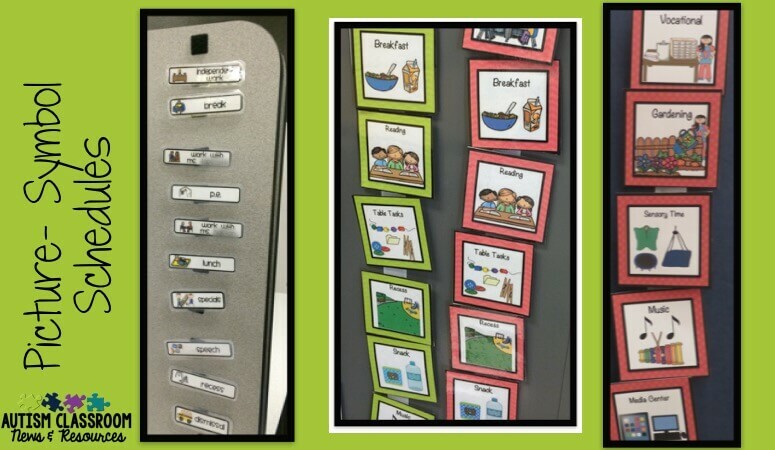 The student can match simple pictures (such as matching a schedule visual to a check-in board). The student doesn’t read well enough to completely comprehend. I always combine the pictures with words so that 1) the staff know what the picture represents and 2) we start to train the word-picture association. Many people feel that photo schedules are a good substitute for pictures when a student can’t read. Many of our students can use photo schedules easily. And these days with everyone having a camera on their phone, photo schedules are easy to make. Lots of apps use photo schedules as well. However, for some students photo schedules aren’t great choices. These students have difficulty generalizing material they have seen. So, if the art area looks different than the picture today, he thinks it’s not the same place. If you change your hair or wear glasses one day, he may not know who you are. For these students, who have focused in on one or two details of appearances, photos may not be the best choice. In addition, photo schedules don’t transfer to new environments as well as picture schedules. In other words, you have to take new photos for a new schedule when staff change or the room changes or when the student transfers. Because of these potential drawbacks, I primarily use photo schedules when I know the student can match photos, but not illustrations. Or sometimes I’ll use them if the student isn’t responding to picture-symbols but I don’t feel like he needs an object schedule at this point because he is gaining some matching skills. I don’t use them very often, but I do sometimes intersperse photos into my picture schedules when there is no good symbol to match the activity. Sometimes a photo really expresses it best. I use object schedules when I have a student who doesn’t respond to picture-symbol schedules initially. Initially, I also may choose them if I know the student doesn’t have matching skills or a solid understanding of common pictures. I use object schedules because they are a more tangible method of demonstrating what comes next. So, I might use a cup for lunch time because the student drinks from an identical cup. I might use his picture he uses to sign in to the Who’s Here board to represent circle time or morning meeting. I would use items that he uses in his everyday activities as much as possible. If I don’t want him to eat them or they aren’t easily contained, I might put them in a container. For instance, I will sometimes use leaves from outside in a clear container to represent walk. Or I might use a bus to represent going home, in which case I’m using representative items. 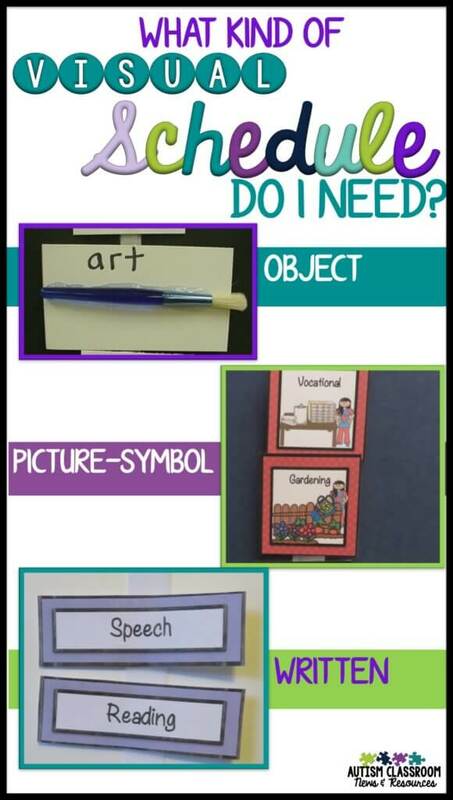 I also may use an object schedule for a student who has visual impairments. For that student, though, I would choose different kinds of objects. Instead of choosing objects that are representative of the activity, I might choose objects based on how they feel. So rather than using a block to represent work time, I might use a piece of plastic with the texture of his plastic chair. Then he knows to feel for that same texture. Your VI teacher can help with this type of schedule. Even when I use object schedules, it’s important that the object be on the parking lot or check-in board for the students to match and check-in. This helps them practice matching their schedules and makes the transition process clearer to them. Whenever I can, I love to use written schedules. They have a ton of pros, but you have to be careful you don’t get misled by them. Easy to change. I can easily cross out something that changed and put something in its place. Quick to create on the fly. If a student can use a written schedule, I can quickly grab a post-it or a whiteboard and write out the steps of a task. In short, they are great. HOWEVER, just because a student can read the words, doesn’t mean he understands them. So many times we think that a student can read but don’t stop to check if he comprehends. I need schedules to be easy for students to use; if reading is hard, the schedule will be too. We might think a student understands and is just being noncompliant. In actuality he may not comprehend the words. Clearly both the cons for written schedules can be addressed by assuring the student can read easily. 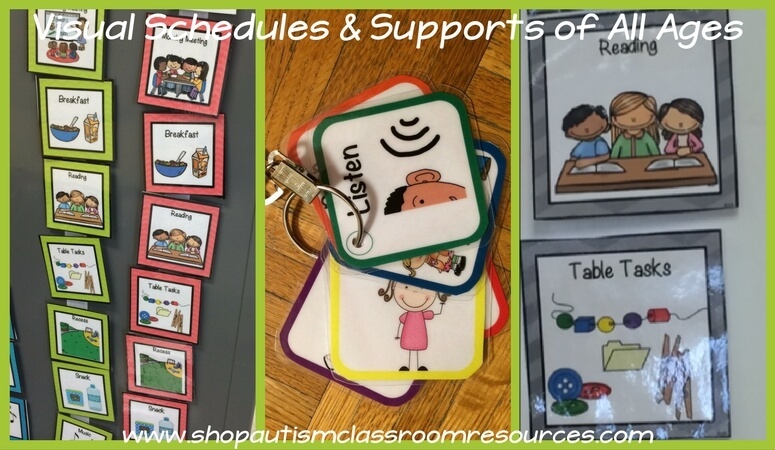 In order for me to use a written schedule, I make sure the student clearly understands the words and can travel to the designated area independently using the schedule. If you have to prompt him, he probably needs at least small pictures next to the words. I also will start a student off with a written schedule on cards. Then I have the student carry the cards and match them to a matching written card at the check-in station. That way I assure that he is getting the function of the schedule. Over time I can fade that part out. However, it really helps some students to manipulate the schedule rather than just check things off. Clearly many of us use a combination of all these types of schedules. For example, it’s hard to depict speech in some instances and it’s easier to use the therapist’s picture. In general, if I don’t know the student’s skills, I start with picture schedules. If the student excels on picture symbols, I might have him use a group schedule and just have a schedule for times when the class is divided (e.g., centers). I might switch him to a written schedule using cards he manipulates or sometimes a notebook he checks off, if he leaves the classroom frequently and his reading is strong enough, . 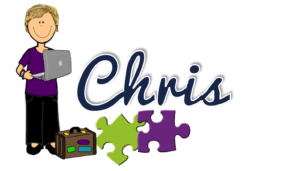 If a student is struggling with picture-symbols, then I move to a photo schedule or an object schedule depending on which the team thinks he needs based on his matching skills. I also sometimes will teach matching with the schedule pieces in discrete trials so that the student can move forward in using it. I hope this gives you some ideas of how to make decisions for your students. Check out the replay of our Facebook chat below to see what others do and check out discussion of questions. 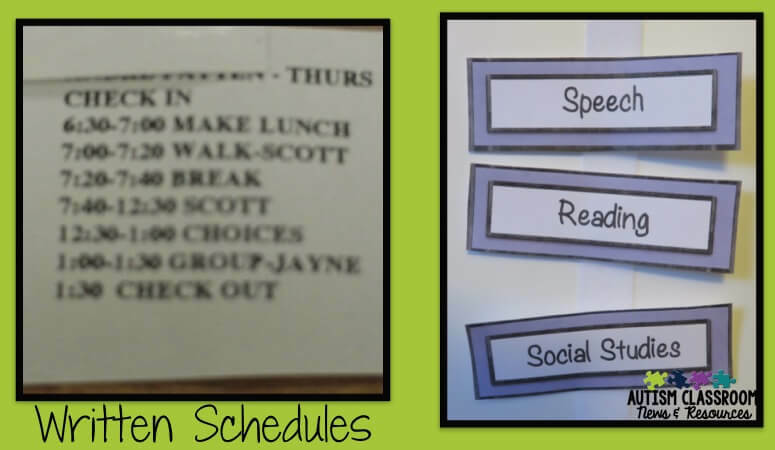 If you are interested in using picture symbol schedules or written schedules I’ve shown in this post, you may want to check out my visual bundles. They are designed for different ages and include both picture and written schedule cards, as well as group schedule and check-in visual cards that match.